Life is Marketing: Did Snap, Crackle and Pop Surrender to the Fat Police? 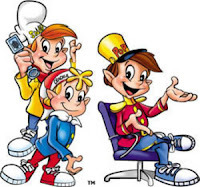 Did Snap, Crackle and Pop Surrender to the Fat Police? Apparently, Tony the Tiger is ok... (Well, actually, he's great, but you know what I mean.) But Toucan Sam and Snap, Crackle and Pop may be on the unemployment line if Kellogg's can't find a new recipe for them by 2008. While nutritionists can debate the merits of their "complete breakfast", the question for marketers is did Kellogg's capitulate to pressures too soon, too late or just in time? Animated cereal characters have been on TV for a generation, so are they really the cause of obesity? As a marketer, can you reinvent an iconic brand relatively quickly? Does Froot Loops even exist without Toucan Sam? If they can get Froot Loops to taste close to the way they taste, stick with Toucan Sam. If it's a dramatically different flavor, then invent a new brand and a new way to market it. Let Toucan Sam live and die with his product. Those are my two cents... Yours? ?